Page Street Publishing, 9781624144172, 192pp. Vanessa Croessmann shows readers how to create beautifully balanced flavors that highlight a variety of textures (broths, creamy and chunky), styles (stews, chilis, chowders, gazpacho, curries, pho, goulash and raw) and seasonal produce. The 80 recipes feature warm soups for fall and winter like Mushroom Quinoa Chili, Chipotle Pumpkin Soup with Apple and Cauliflower Tikka Masala Soup. Cooling soups for spring and summer include Creamy Horseradish Parsley Soup, Celeriac Arugula Soup with Coconut Cream and Crispy Chickpeas and Chilled Creamy Borscht. Packed with fresh produce, healthy grains and fantastic flavors, these meat and dairy-free soups are perfect for dinner, and make convenient and affordable next-day lunches for everyone. 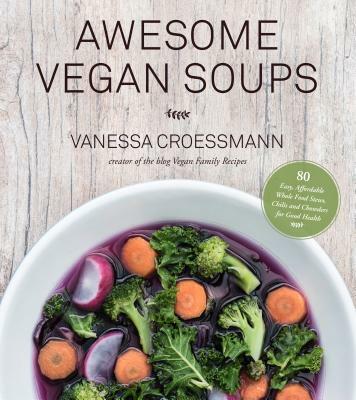 Vanessa Croessmann is the founder of the blog Vegan Family Recipes. She is originally from St. Charles, Illinois, but is currently living with her family in Germany.